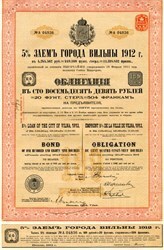 Beautiful certificate from the City of Vilna issued in 1912. This historic document has an ornate border around it with a vignette of a coat of arms. This item has the printed signatures of the City's Mayor, and Members of the Municipal Administration, and is over 100 years old. Some wear on boarder, otherwise EF. Vilnius is the capital of Lithuania, and its largest city, with a population of 554,060 (838, 852 together with Vilnius County) as of 2011. It is the seat of the Vilnius city municipality and of the Vilnius district municipality. It is also the capital of Vilnius County. 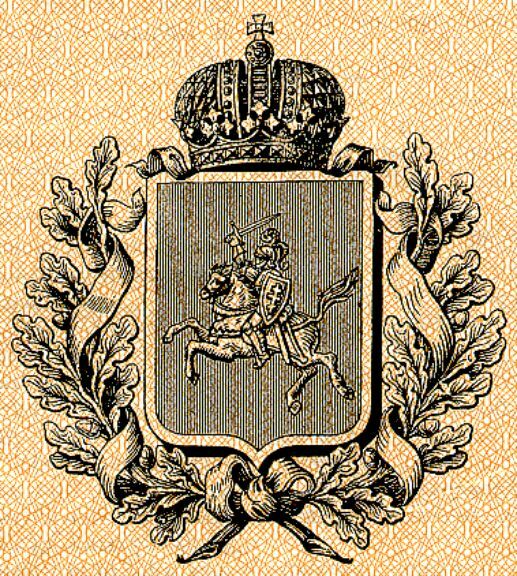 The first known written record of Vilnius as the Lithuanian capital is known from Gediminas' letters in 1323. Vilnius is classified as a Gamma global city according to GaWC studies.